Hello Everyone! Today I am posting over at My Craft Spot. I am sharing a crafty tip with a card using My Craft Spot's Happily Ever After stamp set. A few weeks ago I posted a Baby Boy giraffe card using the set and today I have a Baby Girl card using the same little giraffe! Here are the details! I've been cutting several cuts at a time on my 6x6 paper sheets lately. 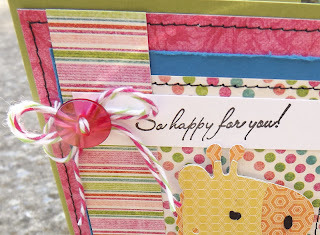 This way, I don't have the scraps of paper laying around and I can throw a card together in no time when I need one! We all know how hard even the littlest of pieces are to throw away, but this way, I feel like I got good use out of it and I can throw those tiny tid-bits away! The giraffe is from the Sugar & Spice Cricut Cartridge and I didn't save it on my Gypsy but I believe I cut 4 or 5 of them at 2.5" each on the 6x6 sheets. The Twinery Pink Sorbet and Green Apple Divine Twines matched my colors perfectly so I tied them onto a coordinating button and I was done with my quicky Baby Girl card and off to the Baby Shower! To see the entire Happily Ever After Stamp Set, click HERE or HERE to check out the great selection of Baker's Twine available at My Craft Spot! I hope you enjoyed the card today! Stop by My Craft Spot to see more great tips and amazing projects from Kimberly and/or the Design Team each day! Thanks for stopping by today!